The Department Of Business Administration conducts a fest christened “RADIANCE” which is being organized annually. Radiance has always been a platform for the students to showcase their talents. It is essentially a management event in which almost all the colleges in Kerala are invited. The senior most batch of management students takes up the responsibility of conducting the fest. 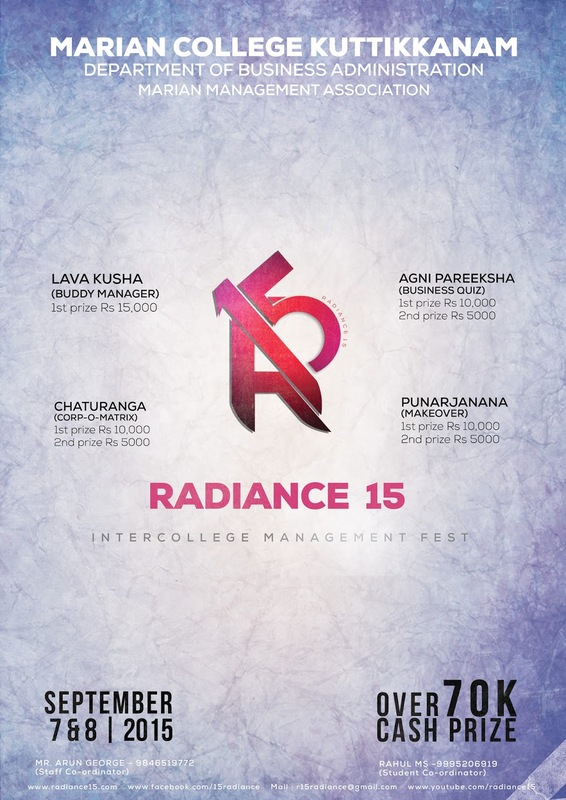 The latest edition, Radiance14 conducted by 2012-15 batch was one of the most successful events ever conducted in the college. · Registration commences at 8:30 am and closes at 9:45 am. · Registration fee Rs.100/- per head. · Only registered participants are allowed to enter the college premises. · All participants are required to bring their college ID cards and permission from the concerned Head of the Department/college Principal for registration and produce the same on demand. · Team members should present themselves at the registration counter for registration. · Candidates who fail to bring the mentioned requirements will not be permitted to participate in any of the events. · Registration fees once paid will not be refunded.A student can participate in only one event. · Candidates who fail to report at the respective venues shall be disqualified. · The organizers retain the right to make any changes to the date, format or rules of the event at any time before or during the event, if situation demands so. · In case of disputes, the decision of the judges and organizers shall be final. · Alcohol consumption and usage of drugs are strictly forbidden. Any such malpractices reported will be dealt with utmost seriousness. · Participants will be liable for any damage caused by them to any property of the college and its premises. · The college premises will be under camera surveillance. Any form of obscenity or vulgarity will not be tolerated.